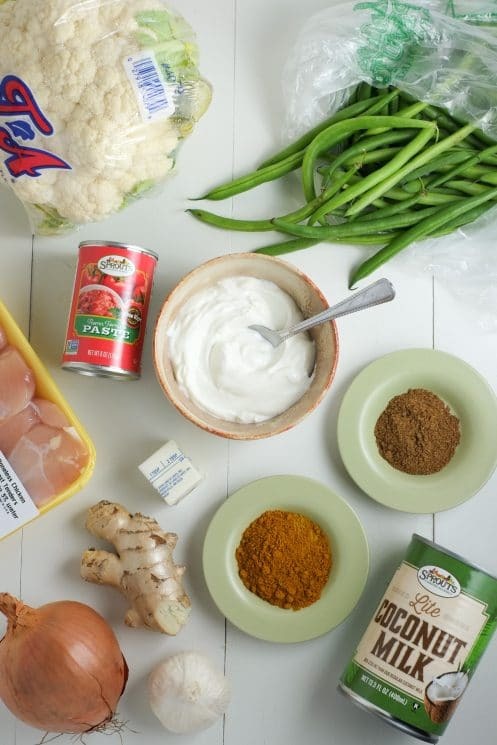 Cooking your favorite Indian dish just got so much easier! 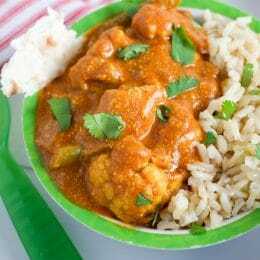 This Instant Pot Indian butter chicken makes a great weeknight meal. Only 2 spices, 10 minutes of prep, and 10 minutes in the pressure cooker! Plus, we’ve made a few healthier modifications for your healthy family! I’m seriously in love with my Instant Pot! I find myself using it almost daily. It just makes cooking and cleanup so much easier for so many meals – and they turn out so well too! Well, now my love of the Instant Pot has just deepened. 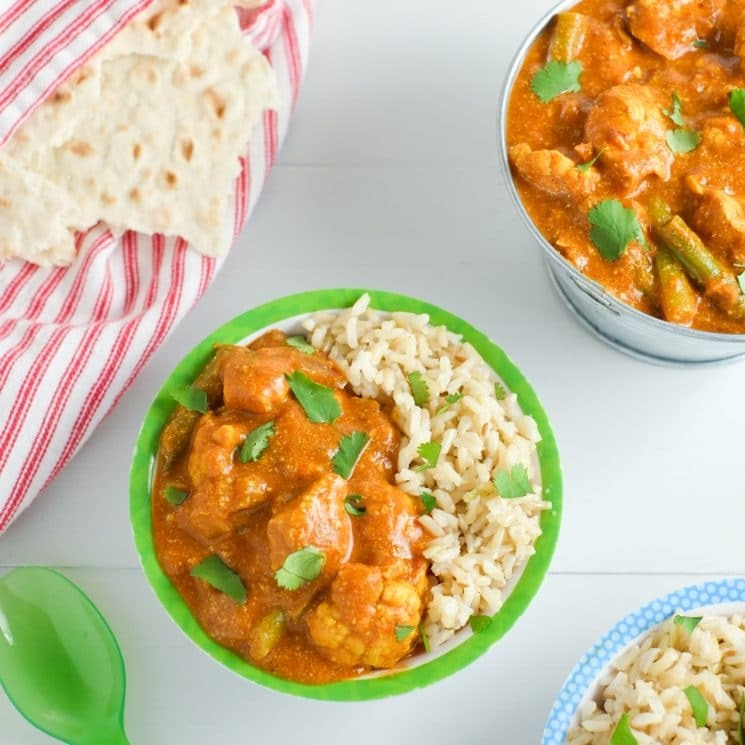 I’ve started experimenting with Indian food in the Instant Pot… and so far it’s amazing! Pressure cooking helps everything cook so well and so quickly, and I feel like it helps the flavors come out so well. Maybe that’s just me – I have no science to back it up. But I’m pretty smitten. 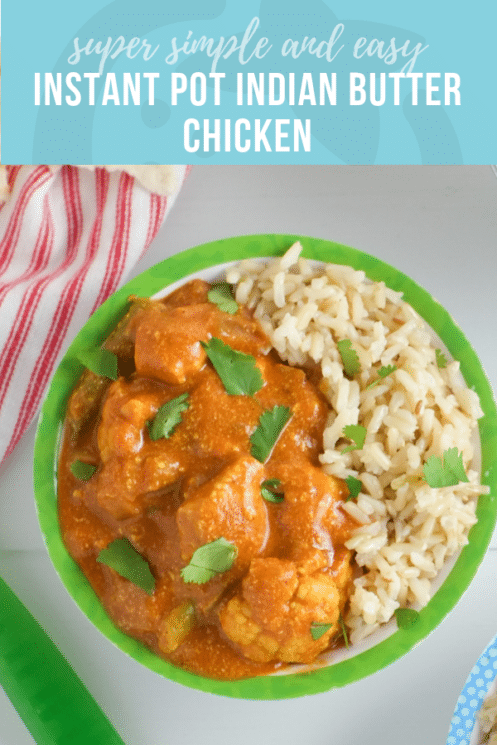 The first Indian meal I have for you in the Instant Pot is butter chicken. It’s so incredibly EASY! It’s a coconut-tomato paste base with just TWO spices (they’re mixes, but still). So often Indian food is intimidating just because of how many spices are called for – so I narrowed it down to garam masala and curry powder (did you know curry really just means mix of spices? Now you do!). It’s also not spicy because I didn’t add any hot spices, but you’re welcome to if you like heat. I fed this to my ten month old, and she even loves it! So it’s flavorful but mild in terms of heat – perfect for kiddos learning to like new flavors. I used reduced fat coconut milk to cut down on excess fat and I really couldn’t taste the difference from when I’ve made it with full fat. Win! I also add some Greek yogurt at the end for added creaminess and some protein. Plus, I have added a few veggies just because I always add veggies (it’s literally my job). But if you want pure butter chicken, feel free to add a bit more chicken and omit the veggies. I won’t be offended. First, spray the Instant Pot with cooking spray. In a separate bowl, whisk together coconut milk, tomato paste, garam masala, curry powder, ginger, garlic, and salt. I’ve done this in the pot itself, but I think it partially removes the cooking spray. Since this dish seems to leave some residue on the bottom, keeping cooking spray in place is best, so I mix outside of the pot now. Now prep your veggies by dicing half an onion, cutting the green beans into 1-2 inch pieces, and chopping cauliflower into bite-sized chunks. The smaller the veggies, the more well-cooked they’ll be. I made mine on the larger size so they were cooked by still firm. Drop these into the Instant Pot. Now cut chicken into small cubes and dump them on top of the veggies. Pour the coconut mixture into the Instant Pot over the veggies and chicken. Agitate slightly until everything is coated. Top with 2 tablespoons of butter, cut into cubes and sprinkled on top. (We needed some butter – it is butter chicken after all). Close the lid and make sure the vent is sealed. Push “Manual,” make sure the pressure is “high” (toggle using the “pressure” button), and set the time to 10 minutes. Once the pot reaches pressure (mine did quickly – probably 5 minutes) and cooks, it will beep indicating it is finished. I recommend a quick release to avoid burning (as always, be careful). Mine actually let out little to no steam, so it was the quickest release I have had yet! Give the pot a quick stir, then add 1/2 a cup of plain Greek yogurt. You can really use any kind of plain yogurt you like, but Greek has extra protein and less sugar so I like it best. A cooked layer of sauce may accumulate at the bottom. Mine didn’t taste burnt but it worried me at first. So don’t worry if yours does this – you can either mix it in or just avoid scraping the bottom when serving. Mix it all up and serve over brown rice and naan, if desired. Cilantro also tastes great as a garnish, though it’s not necessary. 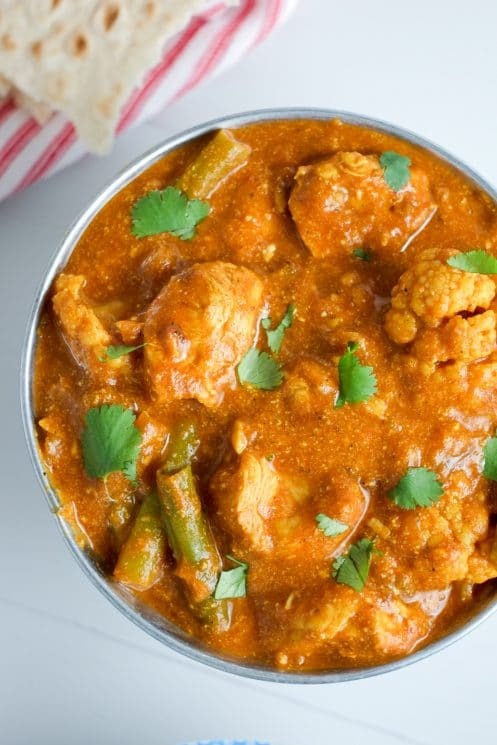 What Indian recipes does your family love? What should we make in the Instant Pot next? In a small bowl, whisk together a can of light coconut milk, tomato paste, grated fresh ginger, minced garlic, spices, and salt. Cut green beans and cauliflower into bite-sized pieces. Dice onion into small pieces. Cut chicken into small cubes. Spray the inside of the Instant Pot with cooking spray. Layer onion, then veggies, then chicken. Pour the coconut-spice mixture over the top and agitate just a little so it evenly coats everything. Cube the butter and sprinkle on top. Close the lid of the Instant Pot and make sure the vent is sealed. Push “manual” and make sure high pressure is selected, then set the time to 10 minutes. Once done cooking, press “Cancel” to turn off the heat, then open the vent to do a quick release of the pressure. Add Greek yogurt and mix well. The bottom may have a layer of cooked sauce, so just avoid scraping this if you do not want to mix it in. Serve with brown rice and/or naan. Enjoy! Thanks for the recipe! 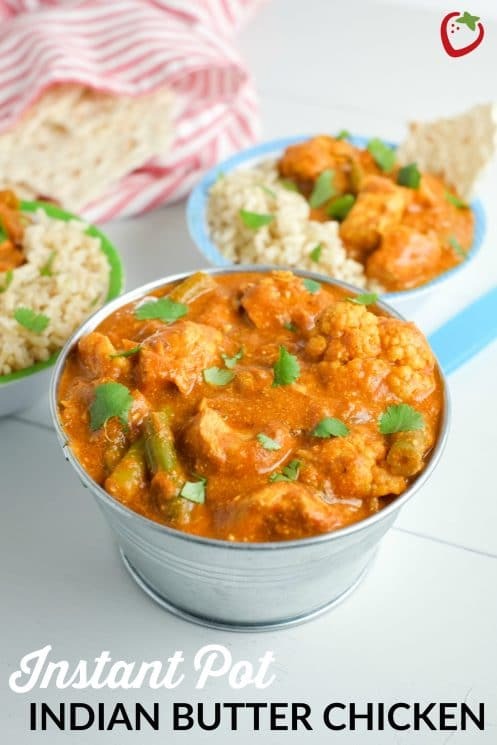 Vegetable korma is my favorite Indian dish, so I’d love to see a recipe for that next! Hi Katrina just stumbled on your wonderful blog. 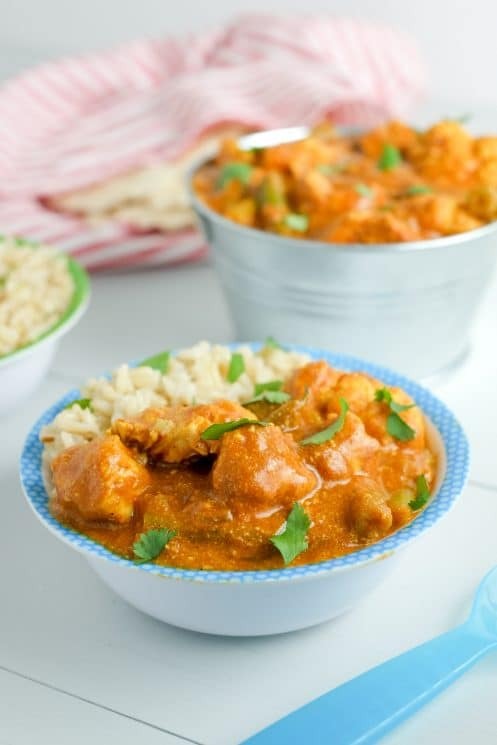 I am a nutritionist from Mumbai, India and even I am pretty impressed with the way your butter chicken has come out and am tempted to follow your recipe myself! Greek yoghurt is unfortunately not available widely in India so I will just add some regular yoghurt! Wow, thanks Krupa! I spent some time in India and absolutely love Indian food, so it’s flattering to hear you like the look of it. Regular yogurt will of course work really well – enjoy! I really wanted to like this but I found it much too acidic. Also, mixing the yogurt into the hot sauce caused it to break down instead of blend into the sauce uniformly. Any suggestions? Hi Maiteeny! Sorry it’s not quite to your taste. To temper the acidity you could add a little sugar or honey, perhaps? As far as the yogurt breakdown goes, I haven’t noticed that when I’ve cooked it, but perhaps you could temper it before adding – put the yogurt in a small bowl and then slowly add a half cup of the sauce, whisking all the while. Then add the yogurt/sauce mix into the pot. I haven’t tried this, but short of waiting for the sauce to cool down a bit before adding yogurt, that’s my best guess. I have noticed that the coconut milk separates a little, but it’s harmless so I don’t worry about it. Hope this helps! Unfortunately, this recipe simply did not work. The contents never came up to pressure, so it just sort of simmered for ten minutes. That is not a safe way to prepare chicken. Every other instant pot recipe we use involves much more fluid than this one, perhaps that’s the issue? Hi Corey, sorry to hear that it didn’t get up to pressure for you. I’ve made this a few times and it’s always worked so something likely went wrong. Recently I made a different chicken recipe in the IP and it didn’t get to pressure either – I was puzzled and frustrated. Upon inspection I found out that my pressure valve had a bit of a clog, so maybe check that. And sometimes the rubber ring can cause pressure issues if it’s not on just right. That’s a good question about the liquid, but it should be more than enough since only 1 cup is required for the Instant Pot to pressure cook and the coconut milk is more than that. Hope this helps! So disappointed, I kept getting the Burn message and had to open and stir, added 1/2 cup water. What we n it finally was cooked an hr later the cauliflower was mush and way to runny. Added the Greek yogurt and it curdled. I’m recooking this as I type this comment. I too had difficulty with this recipe. It appeared to not reach the right temperature to pressurize. When I went to release the steam, nothing came out and the valve was already down, I don’t think it ever popped. It’s a brand new IP, so it can’t be dirty or clogged , this is my first recipe and I’m a bit sad it didn’t work. Any suggestions? I’m so sorry to hear that Gloryanne! I definitely need to look into this more then. It’s worked for me a few times but variations in coconut milk might make it more or less “watery” and impact pressure — maybe? I’ll experiment soon and report back. Is that fat content really that high? Hi Chelsea! Thanks for bringing that to our attention. We had the wrong kind of coconut milk listed in our ingredients. It’s been fixed. Hi – I have made this recipe twice and the IP didn’t pressurize the second time. I believe the first time I made this the IP pressurized without a problem. I think I’m going to add 1/2 cup to 1 cup water next time – it’s possible the sauce is too thick and that’s why it didn’t pressurize. The second time, when the IP didn’t pressurize, it did cook the food after 2 rounds of 10 minute countdowns in the IP. ? I read all the comments first, and based on the issues people were having repeatedly, I preemptively added 6 oz of water to the recipe. Well, I’m on my third try of getting it to pressurize. I finally took the valve apart, cleaned it (no visible clogs), and put it back together. I’ve never had an issue with my IP not coming to pressure before, but third time was the charm. Hoping the vege isn’t too mushy. I was wondering if you could cook this without a instant pot? If so how long would it take on stove or in the oven? This recipe is super delicious! I’d like to make it for a bigger crowd – would tripling the recipe work? Assuming that it will physically fit inside my 6 Litre instant pot, would I simply multiple each ingredient by 3? thanks! I had a very difficult time with this dish coming to pressure. I tried it twice and it only simmered, but never came to pressure and left the veggies super firm and chicken only cooked on the outside. Third time I added 1/2 cup water to thin out the sauce and it finally came to pressure. This was so good! Thank you for posting! We added extra greek yogurt on top because we love greek yogurt, and it was amazing. It is my understanding that Tikki Masala has onion, not Murgh Makhani (Butter Chicken). So frustrated! I doubled the recipe and twice now it has gone through the 10 minute pressure cycle but without actually building any pressure… So the chicken has just been sitting in there simmering. I did some research and learned that if your sauce is too thick that it struggles to come to pressure in time. Delicious! I made this recipe 3 times already and the whole family loves it… including my 5 and 6 y.o boys. It works perfectly each time, no need to change/adjust anything. Thank you so much, this is one of my new favorite recipe. Made this tonight, it came out wonderfully! 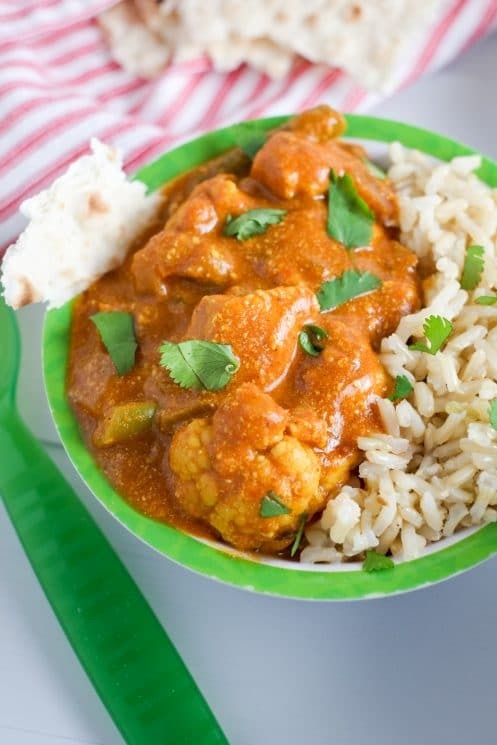 Added hot madras curry powder, as it is just two adults who like a little heat. It did take a while to come up to pressure, but I had lots of time to wait. The cauliflower totally work, added peas instead of beans. Plopped the Greek yogurt a spoon at a time and stirred, nothing separated as mentioned in previous comments. A def do over! Thank you for a great recipe! This is very tasty, after I got the burn message I added 1/2 cup water and stirred, brought it to pressure and it was fine. I tried tempering the yogurt with the sauce in a bowl but maybe I did it wrong it still curdled. What can be used in place of yogurt? How can I double this recipe without ruining it? I despise making singl -meal recipes. Looking forward to trying this! For those who had their yogurt curdle you need to temper it before adding to IP Put small amounts of butter chicken sauce into yogurt and stir. Once it is warm add to instant pot sauce. Tried this as written and found it family friendly and delicious but ended up cooking it primarily on saute since my instapot turned off after notifying me that my chicken was burning just after the pressure cooking started. I have the smaller instapot, but haven’t had this issue with it before – any ideas? Saute worked well but I believe the meat would have been even more tender if pressure cooked. Do I double the time if I’m doubling the recipe? Wow this was awesome! I didn’t have any trouble with the cooking/turning to mush. Only change I made was adding about 1/2 cup of water into the instapot after putting all the ingredients in. Yes, but the instant pot has a few automated buttons to take the guess work out of pressure cooking times. This may be a dumb question, but you put the chicken in uncooked, right? Thanks! Unfortunately, this dish gave me the burn message on my IP. You simply cannot just let the onions sit on the bottom of the pot, even with the cooking spray. You NEED to stir everything. I don’t know why so many recipes don’t tell you to stir it all in, I always have this problem when I don’t stir. I mixed everything together – even the greek yogurt :/ any suggestions on how to cook it now? Oh darn! Did you put the yogurt in immediately after opening the pot? The chicken mixture may need to cool down just a bit, but in our experience putting yogurt into a hot dish after it is cooked doesn’t cause it to curdle. Good luck! I don’t have an Instant Pot. How do I make this on the stove or slow cooker? Hi Iris, we haven’t tried making this on the stovetop or slow cooker, but I imagine it would work just fine. Try searing the meat, then adding in all the remaining ingredients (minus the yogurt) and simmering until tender. If you try it, please let us know how it turns out! We love this recipe and repeat it at least once a month. The flavors are wonderful! My cauliflower usually turns to mash, but we don’t mind. I always add full fat greek yogurt after the quick release and have no problems with curdling. Thanks for the recipe! Hi Katrina just saw your wonderful blog. 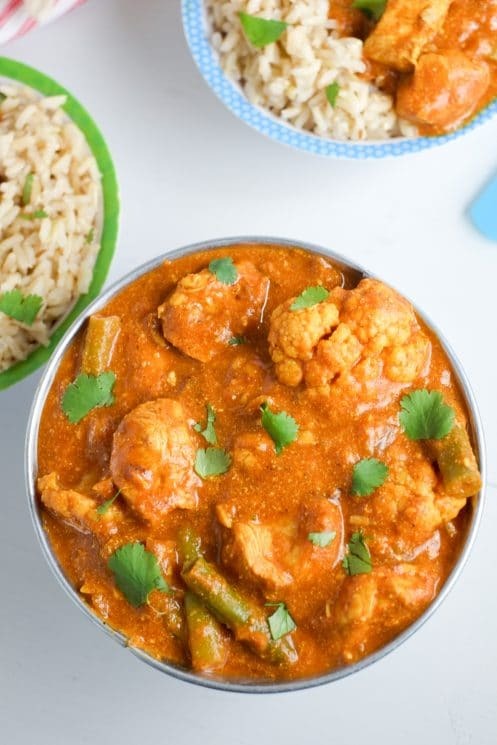 I am a nutritionist in Mumbai , India and I am too impressed with the way your butter chicken has come out. I really appreciate. I’m a big fan of this recipe. It’s simple with few ingredients and really tasty. I’ve never had any issues with my instant pot reaching pressure like a few of the other reviewers … not sure what I’m doing differently. 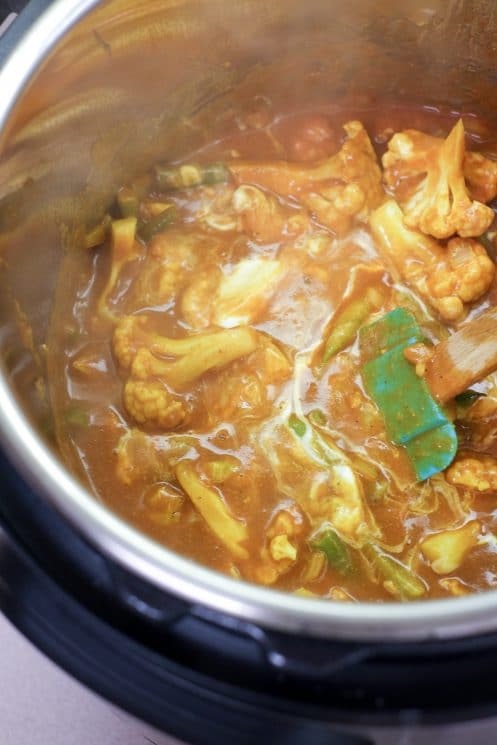 Although I do sub fresh beans and cauliflower for frozen – I just throw them straight into the pot without heating them up. My family (especially my kids) love this recipe! But the only thing is I ALWAYS get the burn notice on my IP. Help! I’ve tried different things to prevent it but nothing has worked. Any suggestions? Thanks!